Whenever I come across an article about vaccines, I tune in. My father is in a wheelchair because of a Hepatitis-B vaccination and although he has been compensated by the Vaccine Injury Board here in the US, our family has never been the same. My father and I will never dance again. So you might think that I stayed away from vaccinating all of my kids but that is not the case. I vaccinated all of my kids, albeit on a very slow schedule, and NEVER let them get a shot when they had even a sniffle. Anyway, the following information on the swine flu vaccination, from a YLE article, is one that I wanted to share. 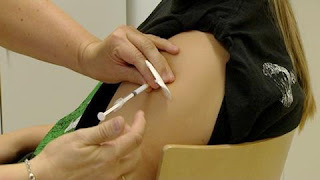 It seems that the Chief Medical Officer of Finland's National Public Health Institute has conceded that it may have been unnecessary to vaccinate children and young people against swine flu. Dr Terhi Kilpi told the Väli-Suomi news that perhaps the vaccine should not have been given to 5-20 year-olds. Kilpi went so far as to say that she no longer recommends the vaccination for this age group. She added that if she had known of the potential consequences, she would have not inoculated 5-20 year-olds. I applaud her for her honesty and openness as it will only help to educate others. The vaccine is now suspected to be linked to an increase in the number of cases of narcolepsy affecting children and young people in Finland, Sweden and Iceland. In Finland, 54 children have been diagnosed with narcolepsy. Still, even though the swine flu vaccination is under suspicion in many regions, the vaccine has been reintroduced in the UK where a new swine flu epidemic has caused the deaths of some 200 people. Dr Kilpi added that the negative publicity surrounding the swine flu vaccine is not worrying because, "Most people understand that vaccinations prevent serious, fatal diseases. The benefits they provide outweigh the disadvantages many times over."